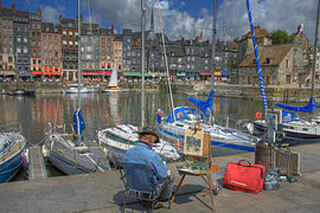 Honfleur Harbor especially known for its old, beautiful picturesque port, characterized by its houses with slate-covered frontages, painted many times by artists, including in particular Gustave Courbet, Eugène Boudin, Claude Monet and Johan Jongkind, forming the école de Honfleur (Honfleur school) which contributed to the appearance of the Impressionist movement. The Sainte-Catherine church, which has a bell tower separate from the principal building, is the largest church made out of wood in France. This article uses material from the Wikipedia article "Honfleur Harbor", which is released under the Creative Commons Attribution-Share-Alike 3.0 License.